Cohesity’s innovative DataProtect technology is based on a powerful and flexible hyper-convergent architecture that can protect physical and virtual platforms, databases and applications, in a single cutting-edge application-oriented solution which extends from on-premise infrastructure to the cloud. 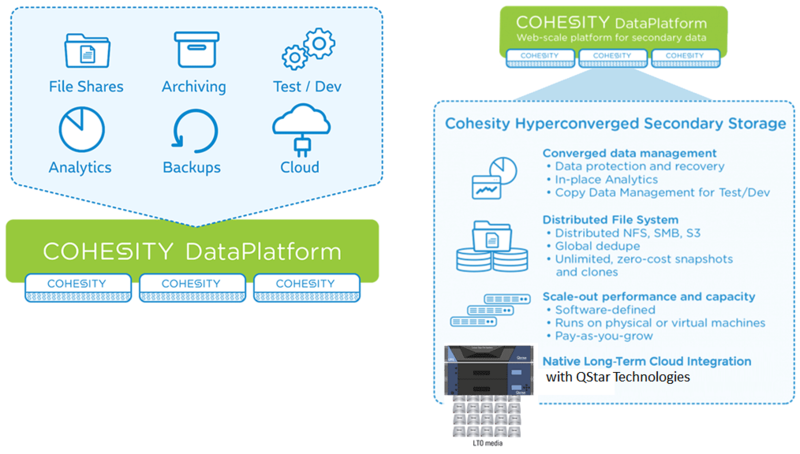 Cohesity has developed an innovative architecture to consolidate traditional storage silos such as backup software, data deduplication, file storage and cloud gateway into a single scale-out platform to create an easy to manage, efficient and scalable environment. Unlike other solutions which use backups as a primary resource, the DataProtect technology is able to create clones of any type of data (backups, files, objects) on a huge scale, at any moment, without impacting performance. The data is presented in NFS / SMB with no restrictions and high-performance allowing applications to use the data transparently without changing the way they work. QStar guarantee native integration with the DataProtect solution to deliver Long-Term Archive services through an Active Archive Tape as NAS platform certified by Cohesity.